Archos 3 Vision review | What Hi-Fi? Best known for its feature-packed, file-friendly media players, Archos has predominantly concerned itself with internet tablets of late. But with the 3 Vision, the company clearly has more portable machines in its sights. The 3 Vision is certainly pocketable, and with just the one control button it cuts a minimalist appearance. The small, slim design appeals, although in the hand it feels rather flimsy and lightweight. Still, cast your eye down the spec sheet and it's clear this Archos machine is very capable. Alongside music and video playback, you'll also find an FM radio, sound recorder and, intriguingly, an FM transmitter. This allows you to send your tunes from the Archos wirelessly to a receiver, such as an in-car radio. There's voice recording, a calendar and a USB-to-composite video cable, too. File compatibility is decent: there's no support for AAC files here, but the 3 Vision can support MP3, WMA, WAV and FLAC, with AVI and MP4 video files compling the roster. Sadly, our first stumbling block is a major one – the Archos is a right pain to use. The unit's single button acts as a ‘back' key throughout, while all other movement is via the touchscreen. Prodding the resistive screen is both a fiddle and inaccurate, but it's the touchscreen's circular scroll that takes the biscuit – it's nigh-on impossible to find to any degree of accuracy, meaning navigating menus is painful. We press on – haphazardly – and look at the 8GB Archos in action. The busy ‘now playing' screen is enough to give anyone a headache, but thankfully the sound is less taxing. Vampire Weekend's Horchata is relayed with much enthusiasm, and is only found lacking in terms of absolute detail. It's also worth highlighting the 3 Vision's 14-hour battery life with music – far lower than that claimed by its rivals. Video performance? Colours on the 3in screen are a little washed out and images are a touch flat, but we could watch it without grumbling too much. 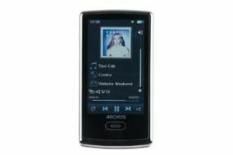 The Archos 3's features are excellent – the inclusion of an FM transmitter is a seriously smart move – and we also like the slimline design. But we can't abide a machine that's such a nightmarish fiddle to control, and the level of performance doesn't make us want to try.